This year, being the centenary of the start of The Great War, 1914-1918, we decided to create a display of poppies in our central courtyard area. The staff and pupils worked together on the project to make one poppy to represent each of the 5,293 lives lost in World War 1 by Leicestershire citizens. The display was helped on its way by almost every member of the school community in a superb team effort, from designing and building to making and displaying each poppy. 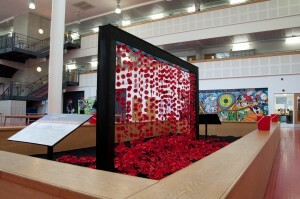 The resulting display is quite stunning and was the focal point of our act of Remembrance, which took place on Tuesday 11 November 2014. We were privileged to be joined on this day by World War II veterans, Eric Lockley and Peter Winkless (Governor at the college), and post-World War II veterans, Roger Palmer and Dale Richardson, (Site Manager at the college). 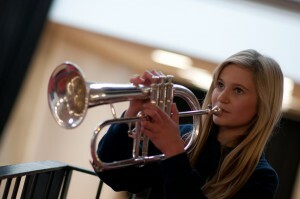 Every pupil, member of staff and visitor to the college gathered in the courtyard area at 10.30 am. The brass ensemble played a fanfare, then Mr Southall, Principal, welcomed all guests and visitors, and spoke about just one of the lives represented by the poppies in the display, that of Private Frank Timson from Enderby. A full account of the life of Private Timson can be found on the following page. Phoebe Howe (8I) read a WW1 poem, The Solider, by Rupert Brooke and a college governor, Fran Speake, gave an address about the Gospel of Saint John which was printed and given to all servicemen in WW1 as a source of comfort. 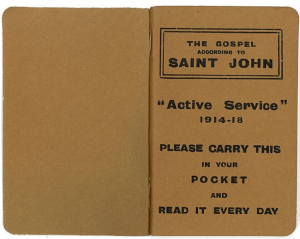 More information about the Gospel of Saint John is also provided later in this bulletin. Just before 11.00 am, The Last Post was performed by Jessica Lapworth (9N) and a two minute silence followed, which was impeccable observed by all. The veterans laid their wreaths on the poppy display, and Yvonne Doores (Staff Governor), Samantha Parsons (9O), Laura Hall (8I) and Joe Matthews (7G) were joined by invited parents and grandparents in scattering the remaining poppies in the display to bring the total to 5,293. This poignant act of Remembrance was brought to a close by Sue Williamson (School Health Coordinator) as she sounded the Reveille. Over the course of World War 1, 5,293 citizens of Leicestershire lost their lives. One of those lives was that of Frank Timson. According to Enderby Heritage Group records, the 1901 census shows that Private Frank Timson was born in 1895, the youngest son of Thomas and Annie Timson. He lived at 125 John Street, Enderby and was one of 11 children. Private Timson joined the 2nd Battalion of the Leicestershire Regiment when he was only 17 years old, not much older than some of our Year 9 pupils at Brockington. 9 September 1914. He fought in battles at Armentiers, Ypres and Neuve Chappelle and records show he was ‘thrice wounded’. 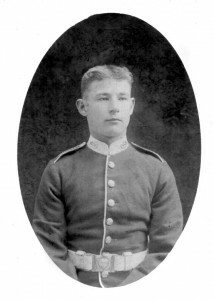 Private Timson returned to action on Sunday 9 May 1915, but sadly, only six days later, he was killed in action at the Battle of Festubert on Saturday 15 May 1915, aged 20 years old. 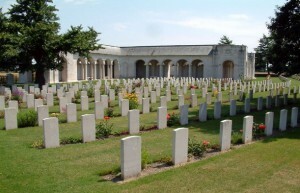 Private Frank Timson is commemorated on Le Touret Memorial, Pas de Calais in France and his name can be found on the marble war memorial plaque at St John the Baptist Parish Church in Enderby. That message meant so much. Soldiers found comfort and reassurance in the Bible, and many made a commitment to God. Mayors of cities bought these gospels to give to new recruits as they shook hands and wished them well at recruitment centres, church leaders bought them to give to people in small villages and some visited the volunteer’s home to give them a copy of the gospel as well so they had a common link with their sons who were away fighting. 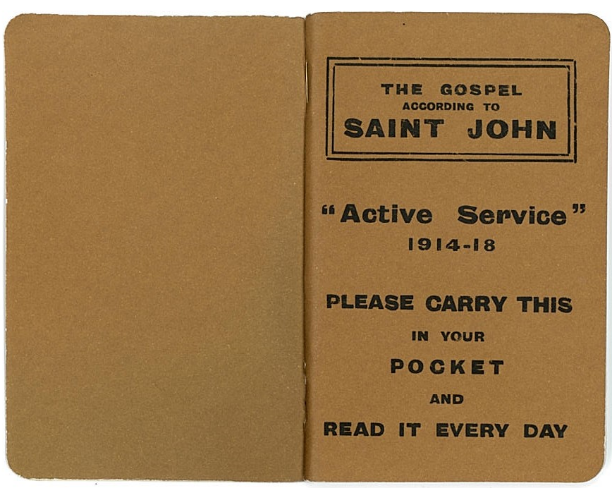 By the end of the war, 43 million booklets of St John’s Gospel and others had been distributed right across Europe, including Russia, to soldiers, prisoners of war, nurses, etc. Many soldiers signed the declaration at the back of the gospel saying they accepted Jesus as their Saviour and many died with them in their pockets. Sometimes when their bodies were searched, it was only their name and address on the declaration that identified them and the gospel was sent home to the family. This year these gospels have been reproduced; same colour, same size, same cheap paper, and same font for writing. The centenary copies provide a link back to 1914 and help us to remember those who read the words of hope, of comfort and of peace. Words of life as we remember those who gave their lives in World War 1, that we might live.